Boil a kettle and fill a saucepan with the hot water. Add the potato chunks and bring back to the boil. Simmer for 5 minutes then add the asparagus for 2 minutes until softened then drain and leave to steam while you heat half the oil in a large frying pan. Tip the potatoes and asparagus into the hot pan with the shallots, sweet corn, garlic granules and jalapenos. Toss to coat in the oil and season. Cook, stirring occasionally, until the veg is browned and toasty. While the veg is cooking heat another non-stick pan with the remaining oil and fry the eggs. 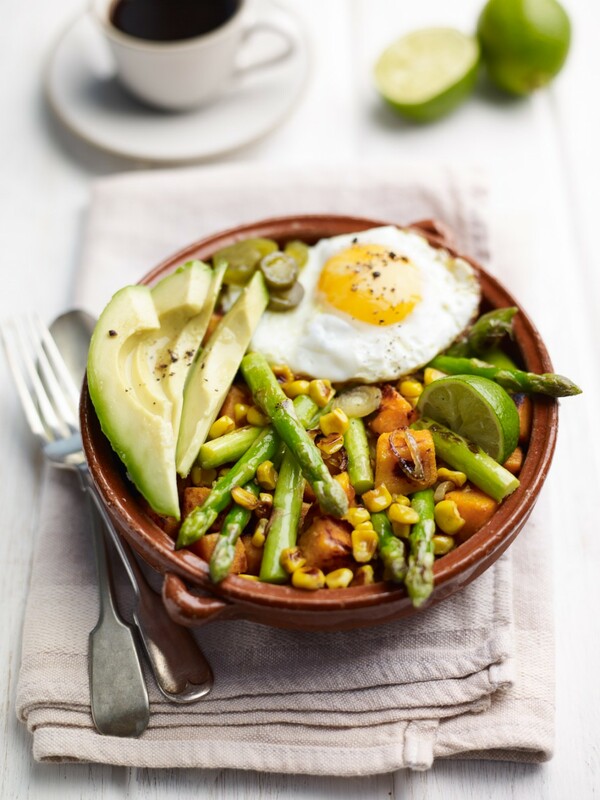 Tip the vegetables into 2 bowls, top with slices of avocado, squeeze some lime over and top each with a fried egg.